A clearly dismayed and annoyed Anderson Cooper repeatedly rolls his eyes at Kellyanne Conway’s spin during this fiery interview. As Market Watch reports, “They’re calling it the most pronounced eye roll ever seen on cable news,” as CNN host Anderson Cooper discussed Tuesday’s firing of FBI Director James Comey with Trump’s special counselor and former campaign manager Kellyanne Conway. A thoroughly annoyed and, at times, dismayed Anderson can be seen rolling his eyes multiple times during the conversation. Anderson asked about the firing of Comey considering the fact that Trump had repeatedly praised the Director while campaigning. “All of a sudden the White House is concerned about James Comey’s handling of Hillary Clinton’s emails?” Cooper asked. 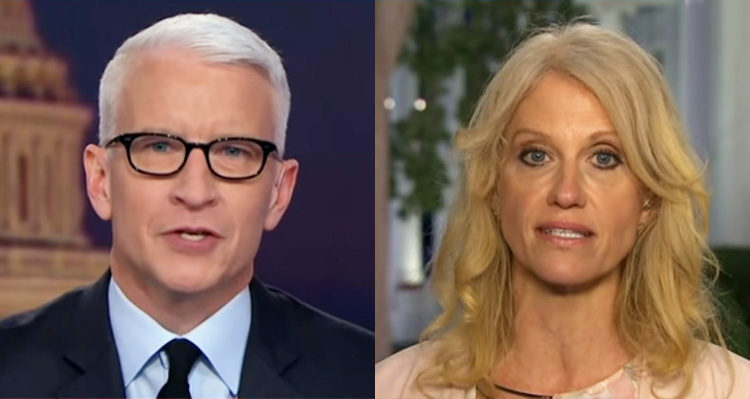 Pressed on the issue of Trump’s sudden change of opinion regarding Comey, Conway deflected – instead talking about how she had appeared on Cooper’s show late last year and predicted that Trump would win Michigan. This pivot prompted the first of many eye rolls by Cooper during the interview. You can check out the two of them sparring in the clip below and be sure to let us know your thoughts about Comey’s firing – its true reasons and where you think the Russia investigation will go from here.